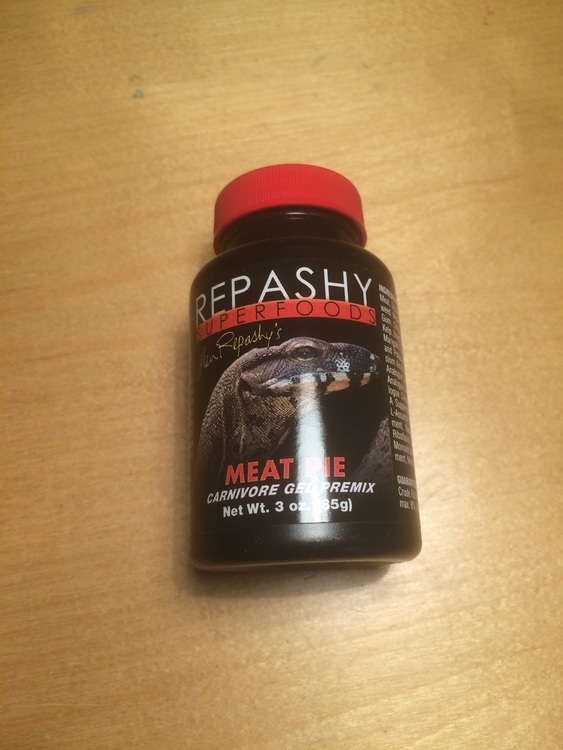 Our Meal Replacement Gel for CarnivorousSpecies of Reptiles and Amphibians. Great for Monitors, Tegus, Newts,Salamanders, Horned Frogs and others. INGREDIENTS:Black Soldier Fly Larvae Meal, Fish Meal, Squid Meal, Dried Brewer’s Yeast,Dried Seaweed Meal, Coconut Meal, Lecithin, Locust Bean Gum, Citric Acid,Potassium Citrate, Taurine, Dried Kelp, Dried Watermelon, RoseHips, HibiscusFlower, Marigold Flower, Paprika, Salt,Calcium Propionate and Potassium Sorbate (as preservatives), Magnesium AminoAcid Chelate, Zinc Methionine Hydroxy Analogue Chelate, Manganese MethionineHydroxy Analogue Chelate, Copper Methionine Hydroxy Analogue Chelate. Vitamins:(Vitamin A Supplement, Vitamin D3 Supplement, Calcium L-Ascorbyl-2-Monophosphate, Vitamin E Supplement, Niacin, BetaCarotene, Pantothenic Acid, Riboflavin, Pyridoxine Hydrochloride, ThiamineMononitrate, Folic Acid, Biotin, Vitamin B-12 Supplement, Menadione SodiumBisulfite Complex). Guaranteed Analysis: Crude Protein min. 45%, Crude Fat min. 8%, Crude Fiber max. 5%,Moisture max. 8%, Ash max. 13%, Calcium min. 1.5%. DIRECTIONS: Bring water to a boil on stove,in microwave or kettle. Pour boiling water into a bowl and immediately stir inpowder (1 part powder to 2-3 parts water). Let cool or immediately pour intomold. Gel will set at room temperature. Cut into pieces or long strips forfeeding. Once made, gel should be treated as fresh food and can be sealed andstored in refrigerator for up to two weeks, or freezer for up to six months.